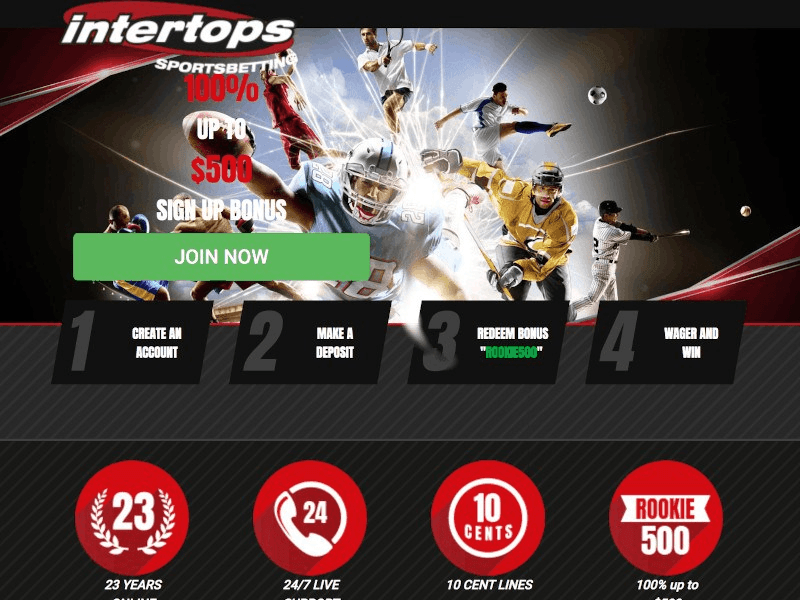 Intertops has been taking bets since 1983, so you know that they are a trustworthy sportsbook. 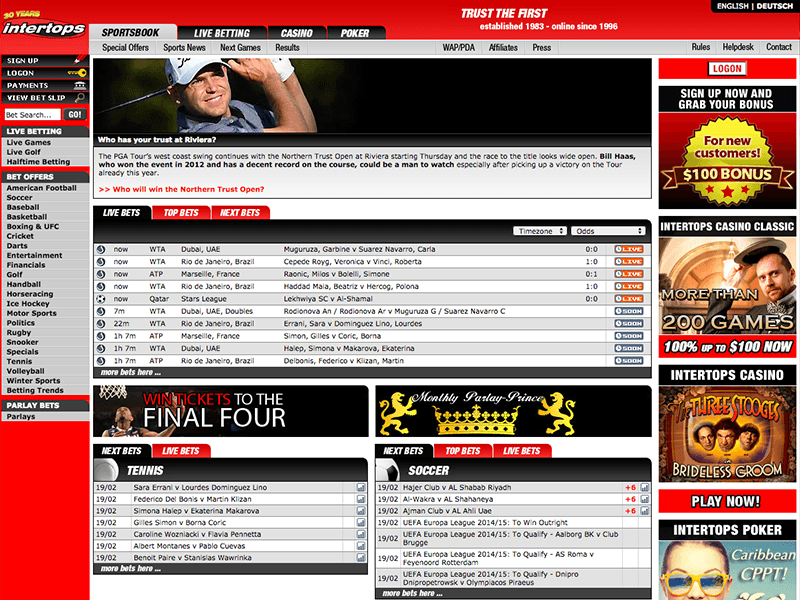 In fact, when they opened an online sportsbook in 1996, they were the first in the industry to do so. They are known for their ongoing promotional offers and the international flavor of their clientele. BONUS INTRODUCTION – Intertops offers a choice of four different bonus offers to new players upon signing up. Choose the one that suits you best. Intertops serves over 180 countries, and yes, one of those on the list is the United States. However, the states of Maryland, Washington, New York, Louisiana, Missouri, New Jersey, and Kentucky are restricted from wagering with Intertops. Australia, Bulgaria and the Czech Republic are among the more promiment nations restricted from wagering at Intertops. The variety of sign up bonuses offered at Intertops is impressive. For starters, if you deposit as little as $20 you will receive a free bet token of equal value with a 16x rollover requirement. Then there's the 200 percent up to $50 bonus. Use the code ROOKIE200 to get this bonus, with a rollover of 8x. The 100 percent up to $100 bonus utilizes the code ROOKIE100 and carries a 6x rollover. The 50 percent up to $200 bonus arrives with a 4x rollover and also uses the code ROOKIE200. As their largest bonus with the smallest rollover, if you've got the cash, this seems like the best bet. There is a wide variety of deposit methods available at Intertops. Visa, MasterCard and American Express are all accepted, as are eWallets such as Bitcoin, Neteller and Skrill. Other options include Sofort, ecoPayz, Money Global, Paysafe and bank wire transfers. As you might expect, the payout options at Intertops are also quite extensive. Checks are the most frequently used options, since Intertops will process checks worth up to $3000 and have them in your hand generally within a week. There is a $50 withdrawal charge per check, however. Bank wires carry the same fee as checks, but take at least two weeks to arrive. And you can anticipate that your bank will likely charge additional fees to process the check upon arrival. Another newer option since 2005 is Bitcoin, and in this case, both deposits and withdrawals are free of fees. Customers can deposit as much as $2500 via Bitcoin and their withdrawal limit will the same amount. Expect the transaction to be completed within 48 hours. The speed of the withdrawal process at Intertops is among the best in the industry and they are extremely reliable at making payouts in rapid fashion. A sure sign that the customer service at Intertops is top notch is that if you scroll the internet seeking a complaint against them, you will be hard-pressed to come up with one. They take pride in their treatment of their customers and offer a safe and secure environment to their players. Support is available in English, German, Spanish, Bosnian, Czech, Danish, French, Croatian, Italian, Latvian, Hungarian, Dutch, Portuguese, Finnish, Russian, and Chinese. There is a 24/7 live chat option available to customers. As well, Intertops offers several email contacts, depending on the querie you have. For general and sportsbook questions, it's bet@intertops.eu. There are also contacts for the poker room (poker@intertops.eu), the casino (casino@intertops.eu) and for payment queries it's (payments@intertops.eu). There are also toll-free numbers to call to reach customer service. For North American clients, the number is 1-866-549-2437. You can even contact them via Skype. If you've always wanted to wager on Brazilian soccer or lay a future book bet on who will win the NSACAR title, then Intertops is the place for you. All of the sports you'd expect to see at a sportsbook are here, from football to hockey to baseball to basketball and soccer. But Intertops doesn't stop there. 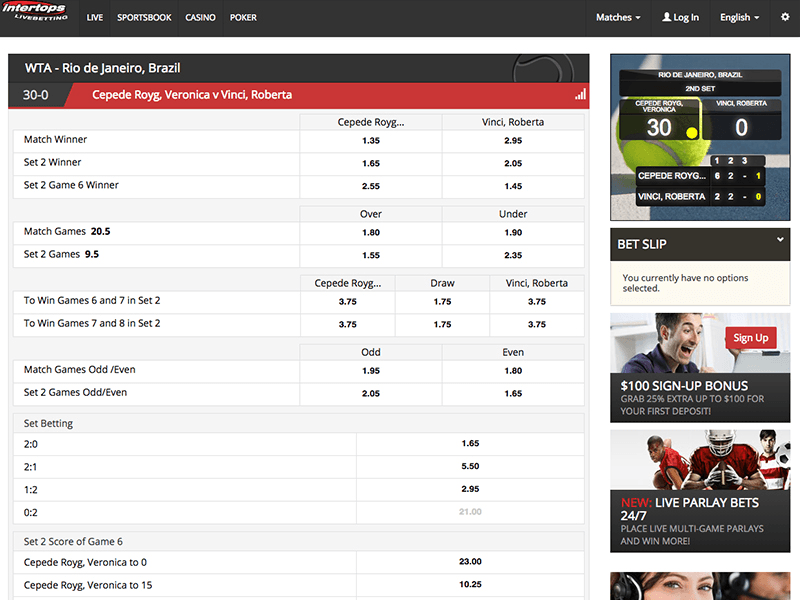 You can wager on boxing, MMA, tennis, golf, rugby, cricket, motorsports and volleyball. Heck, you can wager on politics if you so desire, or non-sport wagering such as the outcome of the powerball lottery in the USA. All of the special promotions currently being offered by Intertops can be found atop the pull down menu on the left side of their web page. While it is comforting to know that your money is safe and your winnings will be paid promptly by Intertops, if they have a weakness, this is it. Their odds, while sharp, are less competitive than at other sportsbooks on the internet. They used to be one of the industry leaders when it came to prop bets, but they've even dialed back in that department in recent years. Even their teaser odds have fallen off from past years. One advantage is you can set the odds to American, decimal or fraction by simply changing the setting on their website. The live betting opportunities at Intertops are massive. Click on the live betting icon on their web page and instantly, you will be taken to a potpourri of betting options from across the sporting world. 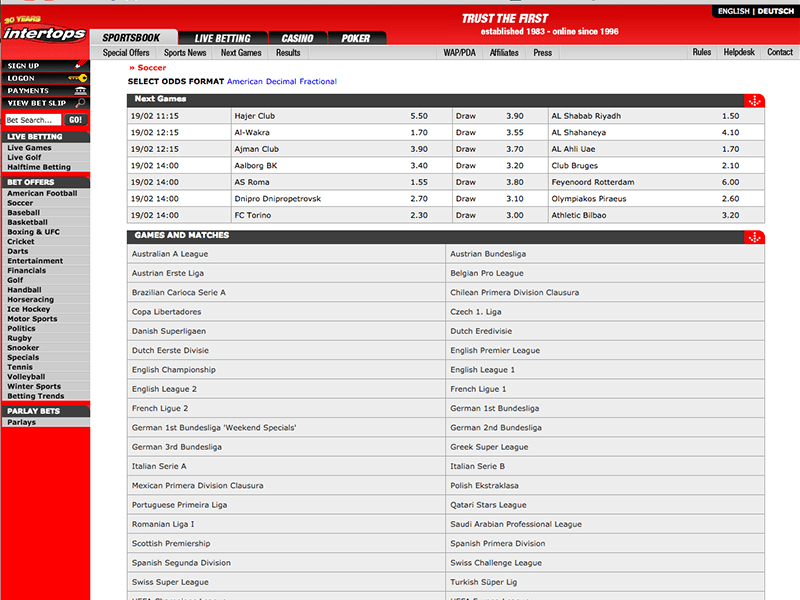 A calendar of live betting opportunities is listed there, as are current and upcoming options for that day. For exampled, on a soccer match, you can make such in-play wagers as the next goal, the next goal of the half, the match winner, the first and second half winners, and the total goals for both teams in each half, or the total goals scored by either team during the game or either half. The opportunities and the options are endless. The Intertops mobile app is available to United States, Canadian and European residents, enabling you to wager from anywhere you might be via your mobile device. The mobile app is user friendly and very easy to navigate, and offers all of the same wagering that you would find at the intertop website on your laptop or desktop computer. You can't beat tradition and you can always trust consistency, and you will find penlty of both of these qualities at Intertops. You will find a never-ending offering of promotions and fast and easy payment methods when the time comes to collect your winnings. Intertops was the first online sportsbook, and more than two decades later, they still rate among the leaders in the industry. You can't go wrong with them, especially if you're new to online gaming and seek a trusted company to partner with as you learn the ropes. Like the sportsbook, the Intertops casino offers a vast array of bonus and promotional offers. You'll find over 150 games, including slots, table games, video poker options, and progressive jackpots. The site is available two versions - golden Casino Classic and Casino Red - and is mobile friendly. Join their poker room and Intertops will give you a 200 percent up to $1,000 deposit bonus to get you started. Play in the satellite tournaments at Intertops and you will be eligible to earn a place at the European Poker Championship. Intertops is among the few online sportsbooks that does not offer wagering on horse racing. Close Visit Intertops and see for yourself... Ok! Let's Check Out Intertops!